On the evening of Saturday, July 5th, Miley started posting pics of her over-the-top pool party that seemed pretty standard, before pics, pics of people showing up, in the pool, fireworks, etc. A little later in the night, the pics got a little more interesting as her and two friends decided to get matching tattoos of her late dog, Floyd, and shed more and more clothing. The final pics of the evening show the three friends all lined up sporting their new matching ink. 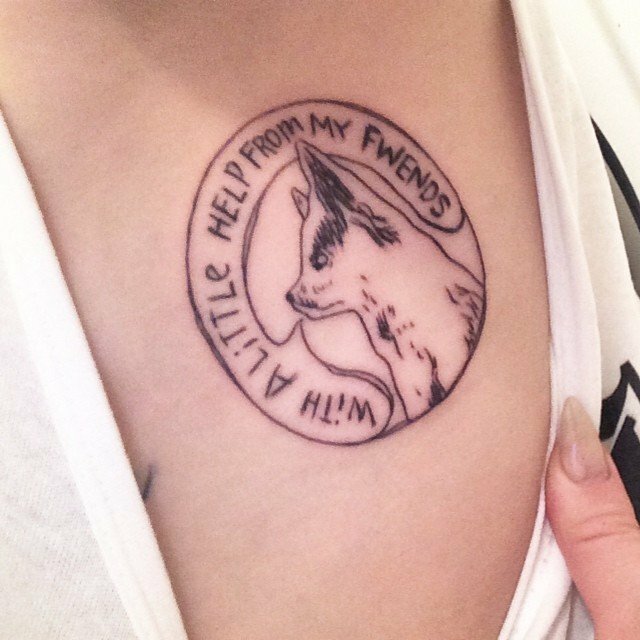 The round tattoo that they all now share is that of Miley Cyrus’ late dog, Floyd, who was killed by a coyote in April. The image is a head shot of the late Alaskan Kee Kai which seems to be saying: “With a little help from my fwends.” in a cartoon-style text bubble surrounding the pooch’s head in a circle, all inked in black. It is inked on her left-side ribcage, next to the “Just Breathe” tattoo under her left breast (which slipped out a little in one of the Instagram pics) that she got when she was only 17. The new ink makes this one number 25 of Miley Cyrus’ tattoos. If nothing else, Miley Cyrus is a genuine animal lover, and it’s sort of sweet to see that she has added a permanent tribute to Floyd to her rapidly growing collection of ink. Miley also has a portrait tattoo of her grandmother on her arm, a dream catcher tat on her side dedicated to her siblings, and now a memorable (if not sort of strange) tattoo tribute to her late pup – three tats inspired by the most important people (and animals) in her life. With Floyd’s sad passing, Miley’s newest dog Emu now joins Miley Cyrus’ three other canine children: a black and white pit bull named – what else – Mary Jane, a Rottweiler-beagle mix named Happy and a Chihuahua mix named Bean. We’re glad to see that Miley will always have a reminder of Floyd to keep her company though!